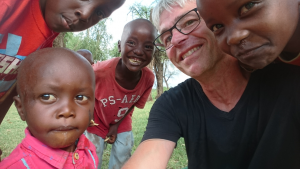 We have now returned from our one month trip to Kenya, where we tested our solution among 10 families in a small village. 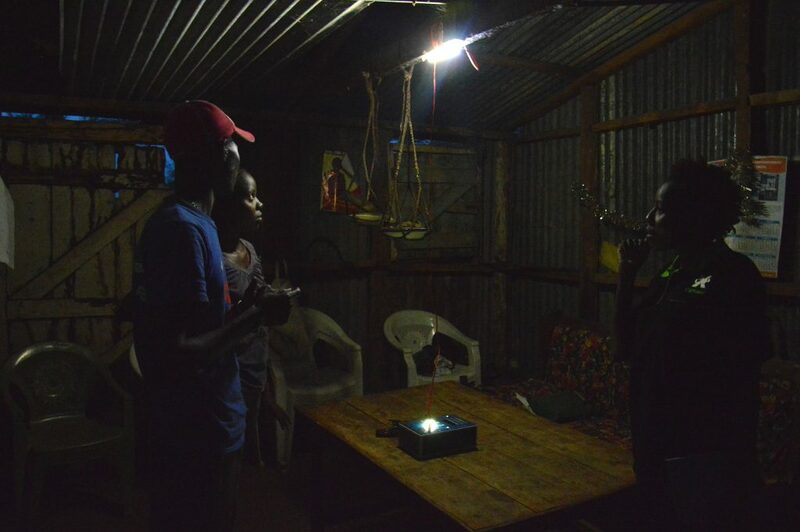 We set up the central solar system at the village school and the families went there for recharging the batteries twice a week. The test was very successful and we learned a lot which we have brought home for the finalization of Peoples Portable Power. I wrote a comprehensive diary (nearly 40 pages) with my experiences and findings – privately and from a business point of view. There were also time for playing with some of the kids from the school, where we installed the solar system. Very nice! Here you have some teasers. If you are interested in reading the complete diary, please contact me on email. 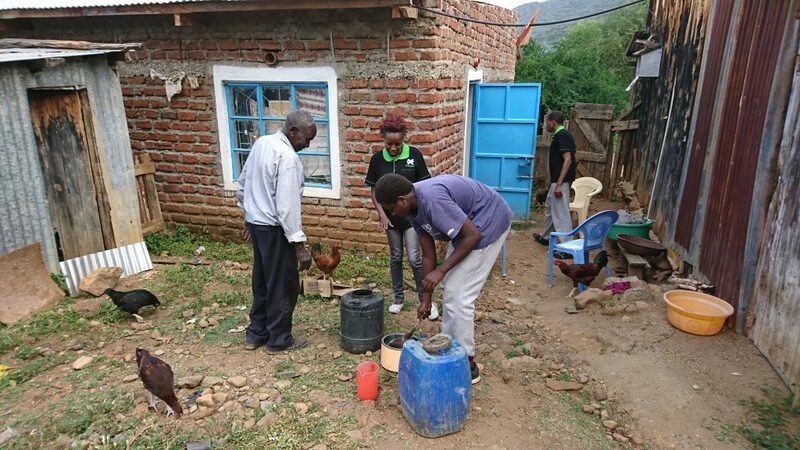 …Later we meet the installer, Mwaura, who is also an engineer and researcher at a technical university and runs his own installation business. He has led several concrete projects with solar and wind power and also worked with minigrids. All of his projects though, were donor projects and he haven’t made actual commercial projects yet. He tells us that he would like to help us and suggests dropping by our demo project when we’re finished putting up the PV system. This gives him the opportunity to inspect it and get an insight of how the families use the system. Most of the day I’ve spent as planned, walking around the neighborhood, taking a bunch of photos and trying to catch the everyday vibe of the people living here. The first thing that struck me is the incredible amount of enthusiasm found in the people here. It’s astonishing how they can make businesses out of almost anything to earn a modest income. M-Pesa stores are everywhere, so it’s no problem to deposit money to your account, charge phones, and so forth, no matter where you find yourself. This is combined with sales of all sorts of goods – everything from medical products to plummers, groceries and newspapers to empty cans, wooden coal, etc., etc. If you can’t find what you’re looking for here, it doesn’t exist! …After all the agreements with both the carpenter and the school are settled we go to Jeremiahs grandfather where Jeremiah is going to stay while we work in the valley. His grandfather lives about a kilometer away and he is very happy to see Jeremiah and his siblings. It’s very moving. We drink a glass of honey water made with his own honey collected in a bucket. The honey is dissolved in water and filtered through a strainer a couple of times and then served. It tastes delicious although I’m a little nervous whether my stomach can handle this mixture! …Before closing time at 5 o’clock the shed for the solar panels and charging panel is done. The only thing left to do now is building a table and a shelf for the batteries and equipment. We spend some time discussing what would be the best option for us regarding safety to prevent our equipment from being stolen. 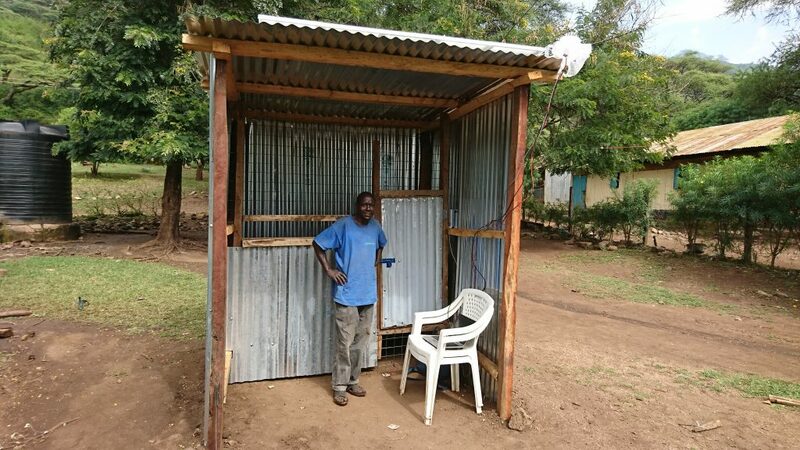 People from the school and the carpenter suggests we build a wall inside the shed with a small door in it which will always be locked except when service is needed. A small hole in the wall is then made which allows people to reach inside with a battery for recharging, without being able to reach any other equipment. The lead-acid battery will also be out of reach which prevents the children from fooling around with it. This is a good solution and we will have it implemented while we’re here and before we go back home. 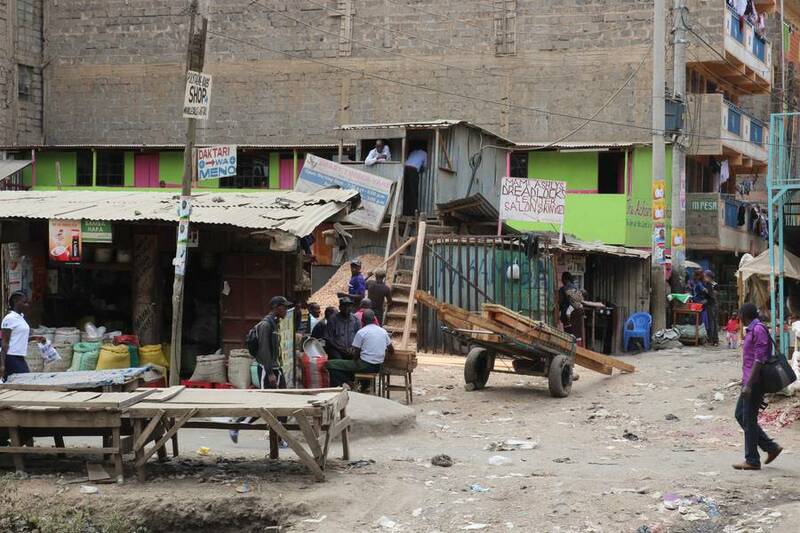 The solution resembles the design of the stands along all the streets and also all of the M-Pesa kiosks we’ve seen. …When I wake up I feel ill and I my stomach won’t accept anything else but coke and biscuits and a bit of coffee. I also manage to force some müsly with boiled water in me. Today I really don’t feel like walking so I take a motorcycle back to the school. On our way there a goat all of a sudden jumps in front of the bike, we crash into it and fall over. We both get some nasty bruises and I bend a couple of ribs. This day doesn’t start very well! At Jeremiahs grandfathers place I irrigate my wounds with bottled water and soak them in methylated spirit – I believe they get clean, but it hurts a lot and frustrates me a bit… and my stomach is still acting funny. It’s going to be a long day. 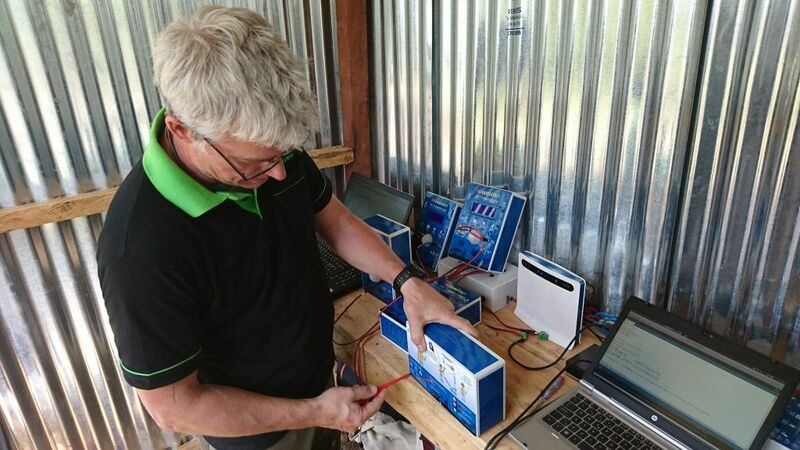 We quickly assemble the installation and the only thing left now is testing the connection between the solar cells through the PPP+ charger and the lead-acid batteries. …Back at the school we are met with a rather surprising sight. Apparently goats and termites have been into the shed and eaten our equipment! Luckily mainly cardboard, but many batteries and the router has also been knocked down from the table. I seems a goat has been climbing around everywhere in here! We need to put up a fence around the installation really quickly to prevent this from happening again. …The big issue here is still distribution and sales. 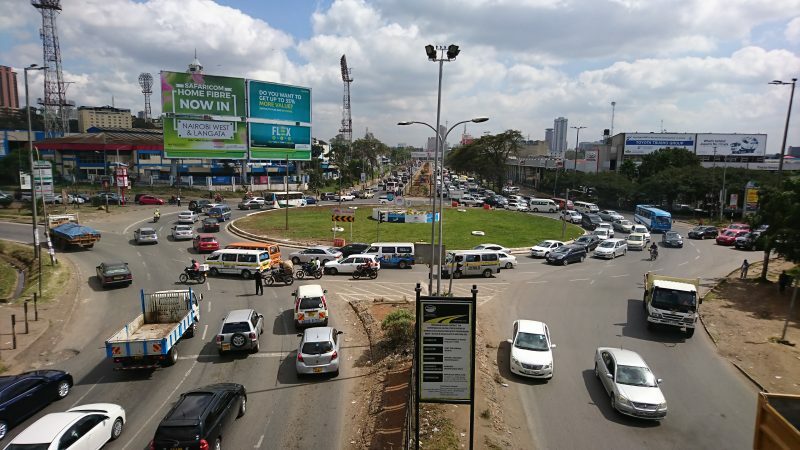 How do we get from three people in Nairobi to reaching all parts of entire Kenya, bringing us a sale of 10-50 installations a week? There’s no way we can do this by our selves. One way to approach this could be to do business with PV installers and/or commission paid salesmen, who then again would do do business with kiosk owners, schools and so forth, offering them a PV system if they find 50 families who would lease our battery. 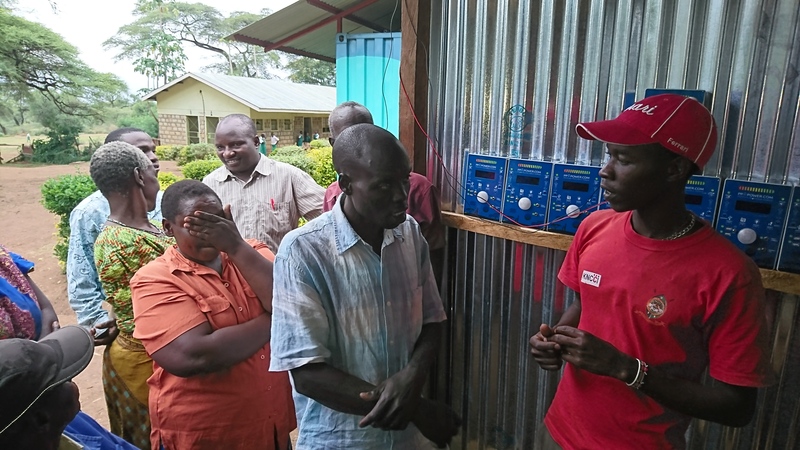 The kiosk owner would get paid per family plus free electricity to his kiosk from the PV system. In this way all of the sales would be commission sales and we would know all our costs. It’s worse now than before and I also throw up this time. During the afternoon I finally feel better and I can start eating some biscuits again. My body is pretty weak like I’m having a fever – which I’m not. Coke and biscuits do give me some energy though. And energy is needed, since I have to do some software programming. I have written Deborah telling her to look for a new charger in Nairobi, but it will have to wait until monday. This means we have to delay the extradition of batteries yet another day. Besides the delay everything goes very well and they are all curious and ask questions and are already coming up with suggestions for improvements. For example a possibility to connect external speakers. They don’t find any problems with our expectations in regards to payments and deposits – on the contrary, rumours have been running through the nearby villages and many already want to sign up. I think that more than 50 families have talked to me about having a Power Pack from us. If the test turns out well I think it would be a good idea to come back to this area and continue work in the autumn. There are also a lot of kiosk owners around who could be interested in using their roofs for our panels. All in all a great day – now we will just have to see what the families have to say during the next couple of days. …When I get to the school I start preparing for changing the charger with the new one Deborah brought yesterday. Daniel also shows up and he would like to know more about how our system works. He’s probably already the one who knows most about how to use the battery and I tell him about some of the more technical issues, which will help him understand the correlations, when he talks with the families. There are a couple of people who called, amongst others an old man who couldn’t get the battery to work. Daniel explained it to him over the phone and now there is no problem. I personally asked the manager of Jeremiahs grandfathers kiosk, Rebecca, how it went along with the battery when they returned home yesterday. Very well, I was told! The only thing had been the radio that was a little low and had a difficult time finding any stations in the daytime. During the night it worked fine. Daniel and I change the charger, so now we’re charging the lead battery with full power! …I meet Daniel as soon as I get there and he tells me everything went well during the weekend and the families have charged their batteries. The last three days is spent at the school fixing the minor issues that come up. I still do some corrections in the software and also end up updating the software on all the boxes before leaving Wednesday afternoon. For some reason the last update that makes charging switch off also makes the light go out, which means the light is out every 15 minutes – not tenable. Jeremiah has also had some challenges with getting the data collection to start automatically after a power out. The M-Pesa payment system isn’t ready or tested before we leave either. So we’ll have to postpone that to the next test later in the year. My own data collection is running fairly well even though LoRa never got to work properly down here. 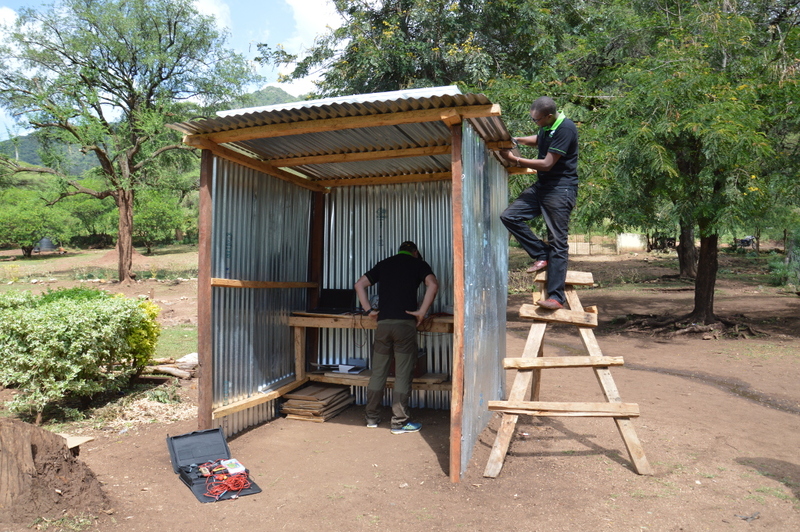 There’s no connection between the huts and the central photovoltaic installation. So LoRa is only working when the batteries are being charged. I’ve tested LoRa by placing the receiver on the roof and outside of the shed. Like this there’s a good connection up to 500 meters which I even tested with a signal/noise ratio at about -100dB. There’s still room before we reach the limit of -130dB. I haven’t been able to catch any signal from any of the huts that are located more than 500 meters away. LoRa needs to be tested thoroughly back home and we need to look at the antenna performance, possibly built in with the FM radio. Or consider to completely abandon the idea. The test has been very valuable. We could never have gotten that much information by researching at home and we still get data back for further analysis. Both on use and user experience. We are now preparing the finalization of our solution and I’m looking forward to coming back to Kenya later this year for the next test of Peoples Portable Power.